Mashed potatoes are one of my all time favorite foods so I don't take this title lightly. 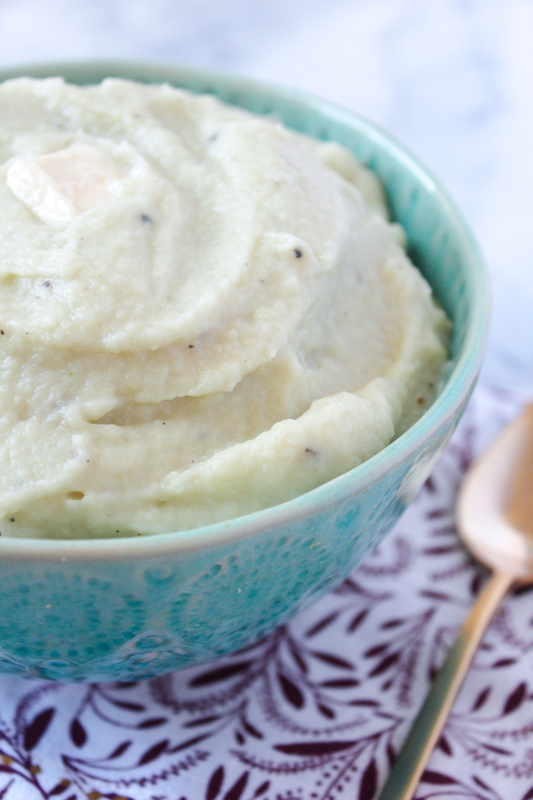 You would never guess a bit of coconut milk, vegan butter, vegan cheese, and garlic would transform cauliflower into something so creamy and delicious you would consider replacing mashed potatoes with it, but it does. Not only does this simple recipe have just five ingredients, it also takes about 10 minutes to make. As you can see from this and this recipe for zucchini noodles, I'm a fan of veggies masquerading as carbs and that's another reason I love this dish. It's not that I think eating carbs is bad, or even follow a low carb diet, it's just that it's so easy to fall into the carb trap when you follow a plant-based diet and I love finding ways to avoid that. Since there are less food groups to work with, carbs often seem like the answer for adding satisfying volume to meals, making it easy to go overboard with them. However, with all their vitamins and minerals, making vegetables the star of meals is what actually makes you feel good. 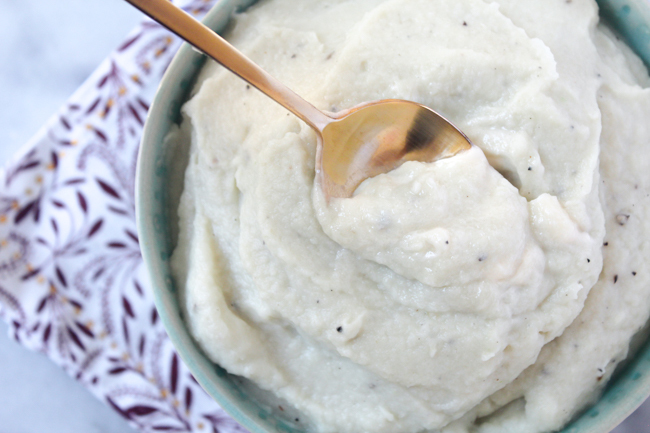 With this Cauliflower Purée, you get the both of best worlds because it tastes like a decadent bowl of creamy mashed potatoes, but contains all the benefits of a veggie superfood. 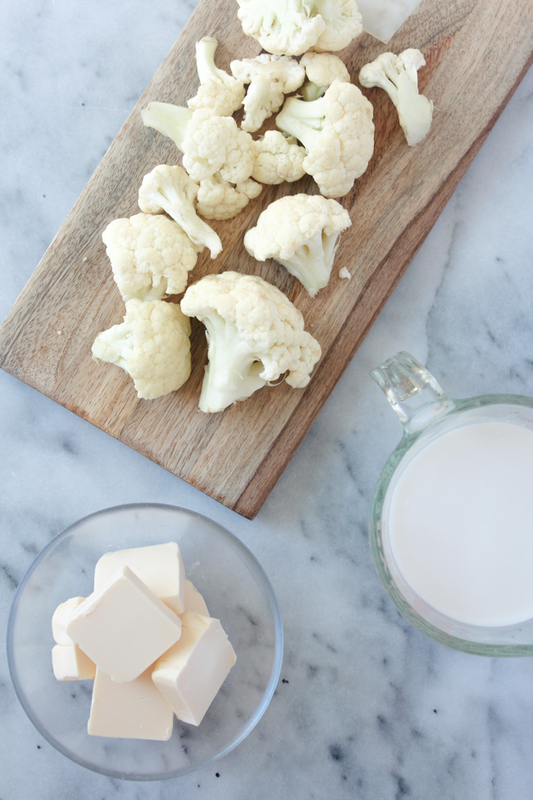 Just one serving of cauliflower provides 77% of your daily recommended Vitamin C. The cruciferous vegetable also contains sulforaphane, which has been shown to kill cancer stem cells and also supports blood pressure and kidney health. Although cauliflower lacks a dark leafy green color, it's still a nutritional powerhouse and yet tastes incredibly indulgent in this recipe. Delicious + healthy = the best combination. - Steam cauliflower (if you buy the florets from TJ's they can steam in the microwave in the bag). - Add all ingredients to a food processor and process for a few minutes until smooth, scraping down the sides as you go if needed. Season with salt and pepper. this looks like such a healthy and yummy recipe to try. have a great weekend. Thanks, Geri! It really is both of those things! I guess your blog will be very helpful to me! 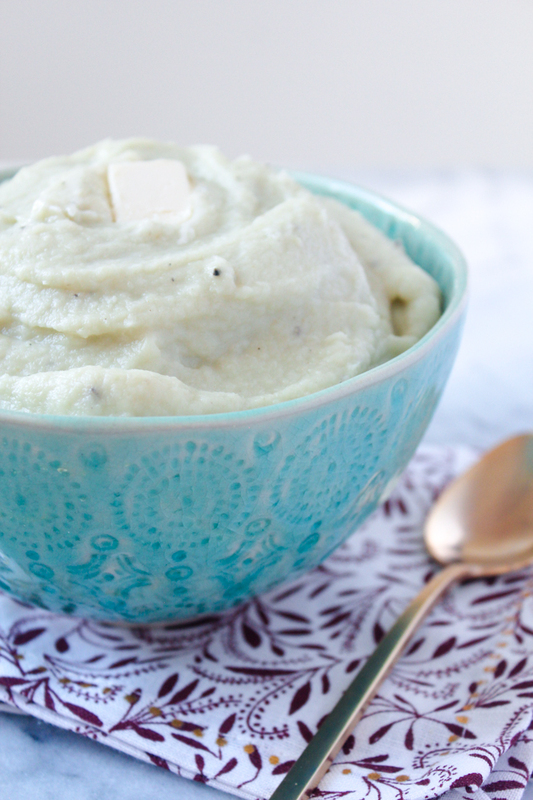 I should try that cauliflower puree/ mashed cauliflower! Haha my blog will definitely help with that! If you like zucchini, I suggest starting with the zucchini noodles with oil-free roasted pistachio pesto. It is literally to die for and one of my favorite recipes I've posted. You can find it in "Mains." Thanks for stopping by!